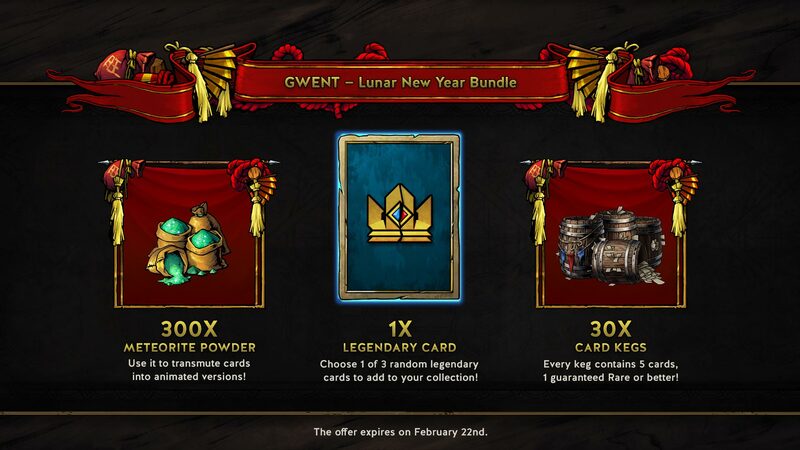 A brand new Lunar New Year Bundle is available now in Gwent for a limited time, according to an announcement today from CD Projekt Red. The bundle offers a pile of meteorite power and tons of kegs to help Gwent players ring in the lunar new year right. The bundle includes 300 Meteorite Powder for transmuting cards, 30 Card Kegs containing five cards each, and one Legendary Card to enhance your decks. If you want to animate your favorite cards or just need more rare cards to pad your favorite Gwent decks, then you should consider picking up this bundle while it lasts. Shupe’s Gwent Lunar New Year Bundle will only be available until February 22 on PS4, Xbox One, and PC, so you’ll have to act fast to add these goodies to your collection. Gwent is a standalone collectible card game based on the minigame in The Witcher 3: Wild Hunt and is being developed by CD Projekt Red.